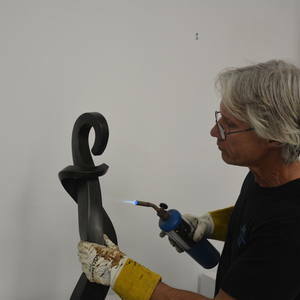 Born in Miami Beach, this self taught artist started creating functional art made from stone, such as candle sconces, and coffee table bases in the mid '90's One notable influence was the introduction of the masonry cut nail into Darren's work. The keystone-like shape of the masonry cut-nail has a classic design that became a building block of Darren's work. In Darren's latest cast bronze series, there is a tangible and passionate energy that can be seen in each of his abstract pieces. The dynamic energy of mutual attraction and fondness captured between the two figures in each of the sculptures, is the essence of what is endearing about Darren's work. This concept actually happend by accident. I was working on a wall hanging piece with real masonry cut nails. I had bent and twisted a few of the nails to incorporate into the piece. I reached to pick up one of these twisted nails and it had another nail intertwined to it. At that moment, I saw an intimate interaction between the two nails as they clutched and hung onto each other, and I then realized that I need to expand on that concept and create a series of sculptures based on relationships and human emotion.